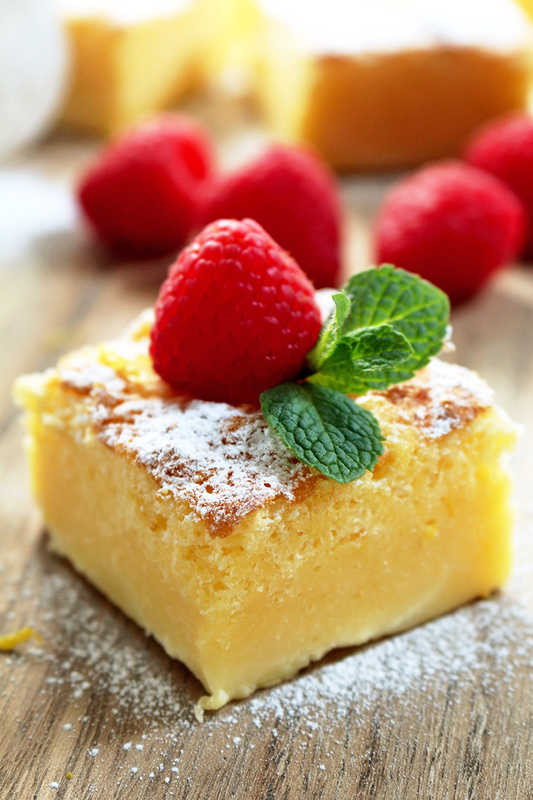 Lemon Magic Cake – this simple, sweet and sour cake really deserves its name – Magic. Do you like lemon? How about lemon cakes? I love lemon in every combination – as lemonade, in my tea, with chicken and in desserts. Lemon desserts are my favorite because they aren‘t too sweet and I like their sour taste. 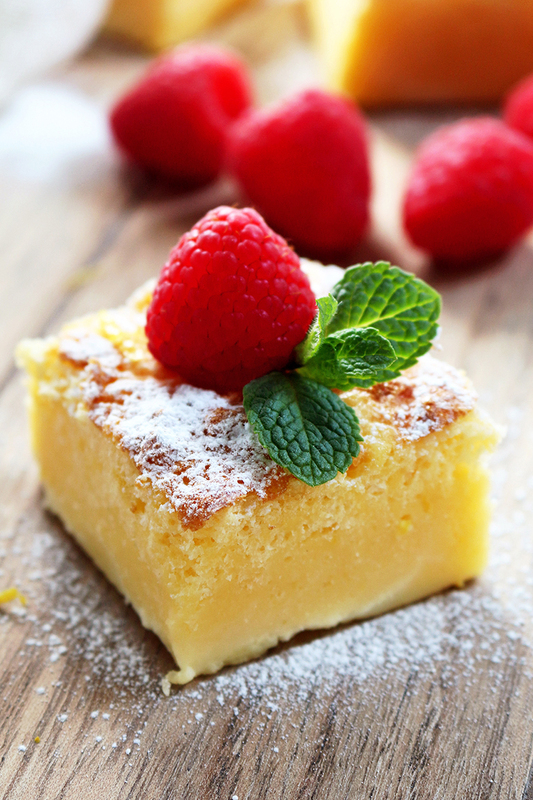 I prefer simple and light desserts, so Lemon Magic Cake is just right. You must be wondering what is magical in this cake. Plain ingredients, easy to prepare, you make one kind of batter and get a cake with three different layers. It can be called 3 in 1, or smart cake. You bake it on low heat, in one baking tray and get three different layers: spongy on the top, creamy in the middle and fudgy at the bottom. Love at first bite! This cake is just right for me, light, not too sweet and easy to prepare. It is very important to be careful with separating egg yolks from egg whites, while preparing them. Make sure egg whites are well beaten, because they form the firm layer during baking. Otherwise, they will melt in with the other ingredients and you won‘t get your layers right. Lemon Magic Cake is so delicious. My husband and I loved it the first time we tried it. If you like lemon desserts check out Blueberry Lemon Cheesecake Cookies. Here are some more suggestions for great cakes – Fresh Strawberry Cream Cheese Cake, Chocolate Mousse Cake and Easy Fresh Berry Cream Cake. So, get busy, prepare Lemon Magic Cake, put some powdered sugar on the top, decorate with fresh fruit and enjoy its perfect taste and smell. 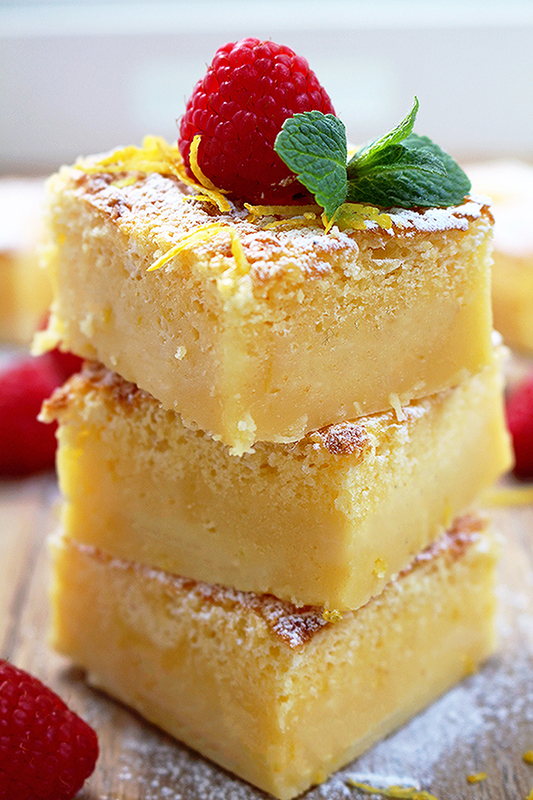 Lemon Magic Cake – this simple, sweet and sour cake really deserves its name - Magic. Preheat the oven to 325 F. Line 8x8 inch baking pan with parchment paper. Beat the egg yolks with sugar and salt until light and creamy, using an electric mixer, medium-high speed. Add butter and vanilla and beat for another 2 minutes. Add flour and beat at low speed, until combined. Put some lemon zest, lemon juice and continue with beating at low speed, adding milk slowly. Set aside. Beat the egg whites with wine vinegar, using high speed until stiff, for about 4 minutes. Gently fold in ½ of the beaten egg whites in the batter that has already been prepared using a spatula, repeat until all egg whites are folded in. There should still be white bits of egg whites floating in the batter. Pour batter into baking pan, put in the oven and bake for 45-60 minutes. The baking time could vary depending on the oven. I baked mine for 50 minutes. Take out of the oven to cool completely. 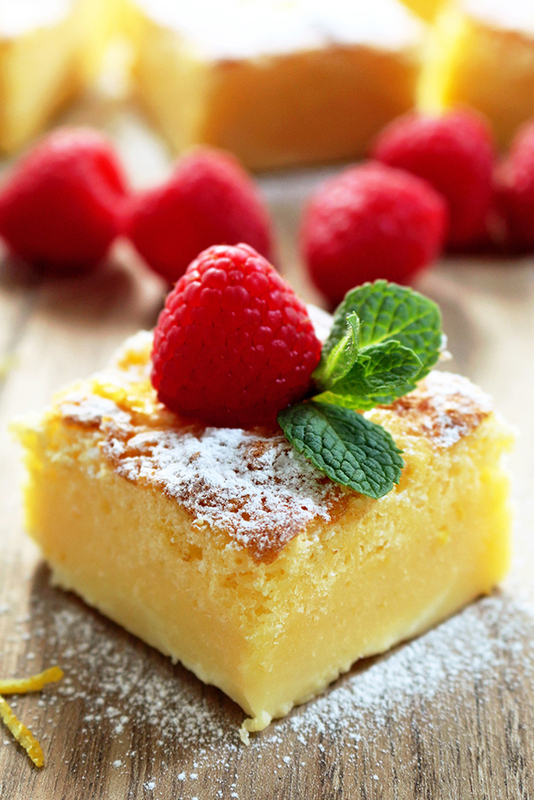 Cut it into squares and sprinkle with some powdered sugar. Decorate with fresh fruit. The cake is ready when the top is golden and the cake is firm to touch. The inside of the cake is soft and it trembles when you touch the top layer. That‘s OK.When the cake cools, the inside hardens. Looks so good – can’t wait to try it! !